I’ve never been a huge fan of ground turkey. But, since it’s a nice lean meat and a good substitution for some more unhealthy options, I’m willing to give it another chance. 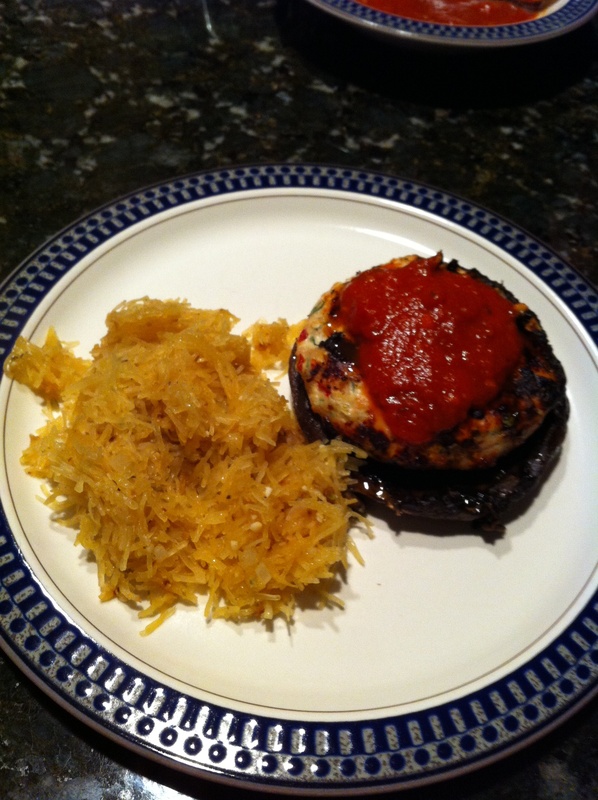 A few nights ago we made our own recipe of portobello turkey “burgers” and spaghetti squash with garlic. It was my first time to make and taste spaghetti squash, and let me say that I’m in love! It has a crispy texture, so if you’re looking for an exact exchange for pasta, you may be disappointed. But let’s just say that I liked it enough that I could probably exchange it for pasta for most italian dishes that call for thin noodles. Once topped with some marinara sauce, my mouth could hardly tell the difference. It’s a little more like a meatball recipe, but like I said… I’ve never liked ground turkey. So, if I can mask the taste with other healthy goodies, it’s a win! We mixed all the ingredients and formed patties to put on the grill. We also grilled portobello mushrooms (lightly brushed with olive oil and sprinkled with salt and pepper). Top the grilled mushroom with the grilled patty and a little marinara sauce and voila… a great italian “burger” served with a side of spaghetti squash. 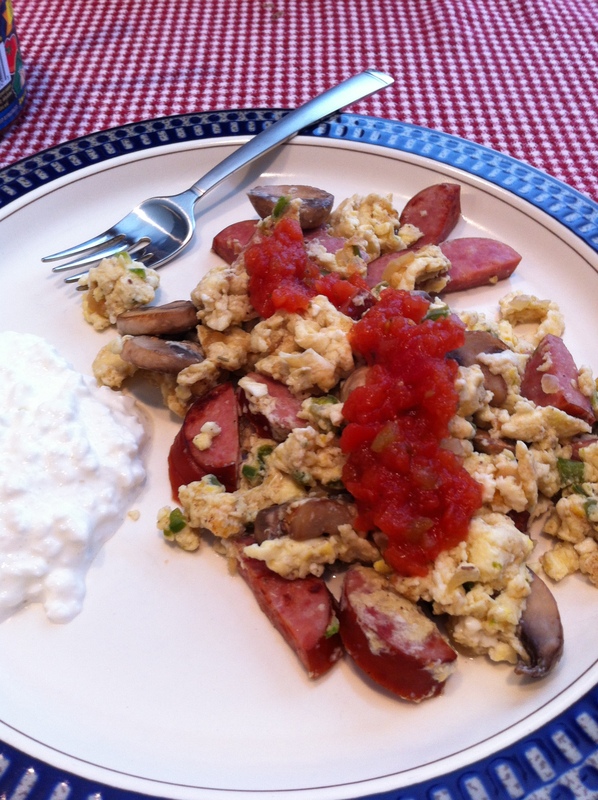 The eggs I’ve been making each morning have had onions, mushrooms (because almost everything should come with onions and mushrooms), whatever peppers are chopped in the fridge, one whole egg and 2-3 egg whites, turkey smoked sausage. Tony and I then share it. This particular morning, we added salsa and I had a small serving of cottage cheese to work on some calcium for the day. So far so good… I think I’ll make some mini fritatas (with veggies and turkey bacon) tonight to warm up in the microwave for my early morning commute to Nashville.